The subject of the meeting held today at the office of the Secretary General of the Decentralised Administration of Peloponnese, Western Greece & Ionian islands, Mr. Tasos Apostolopoulos, was the reforestration project in Parnonas. • Life Project, which cost 1,837,000 euros, for the reforestation of 2,900 acres with 450,000 plants, which is co-funded by the European Commission and the Special Secretariat of Forests of the Ministry of Environment and Climate Change. • Project which cost about 900,000 euros for the reforestation of 1,082 acres with 173,000 plants, which is co-funded by the European Economic Area and the Ministry of Regional Development and Competitiveness. The significant importance of the above mentioned projects, as well as the overall contribution of the Forest Service, emerged during the discussions. "It is necessary to promote the work of those who toil on the Greek forests. The reforestation effort in Mount Parnon and the work done in ﻿Forest Service of Sparta must be made ﻿acknownleged by the world," said Mr. Apostolopoulos. ﻿In February, the Secretary-General will visit the area in order to be briefed in-situ for the restoration status of the natural environment. 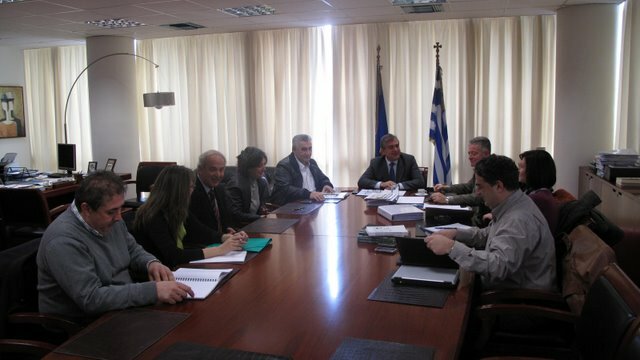 The meeting was attended by the Director General of Forestry and Rural Affairs of the Decentralized Administration Mr. Antonios Katartzopoulos, the Head of Directorate of Coordination and Inspection of Forests Mr. Nicholaos Bakoulopoulos, the Head of Section of Planning of Forest Development Mr. Panayiotis Drougas and the forester of the Directorate of Reforestation and Watershed Management Mrs Despoina Paitaridou .On behalf of the Special Secretariat of Forests of the Ministry of Environment and Climate Change the head of Forest Service of Sparta Mrs. Panagiota Simadi, the Director of Laconia Forest Service Mr. Paraskevas Koutsogiorgas, the foresters- representatives of the Greek Biotope-Wetland Mr. Petros Kakouros and Mrs. Eleni Fytoka and the coordinator of the Management Body of Mount Parnon & Moustos Wetland Mrs. Vaxevanidou Zafiro.